I’ve been wanting to write about Birmingham’s best cocktails bars for a while now. The city is brimming with independent bars, and many of them are also committed to celebrating the city’s art, craftspeople and culture. Over the last few months I’ve been on the search for the artiest bars in Brum. I was surprised at just how many showcase artwork by contemporary artists, create art-themed cocktails, or stage exhibitions. From Digbeth to the Jewellery Quarter, here are my top 9 choices for bohemian, quirky bars in Birmingham. Cheers! You’ll find this city bar on the piazza of One Snowhill. If the sun is shining you can sit outside on the terrace – perfect for people watching. The bar supports local artistic talent with regular events and exhibitions of artists from Birmingham, such as photographers Philip Singleton and Sophie Hedderwick. The cocktail selection is classic, and the wine list extensive. Bottomless brunch on the weekend is a must, as are the seasonal bar plates at £5 each. 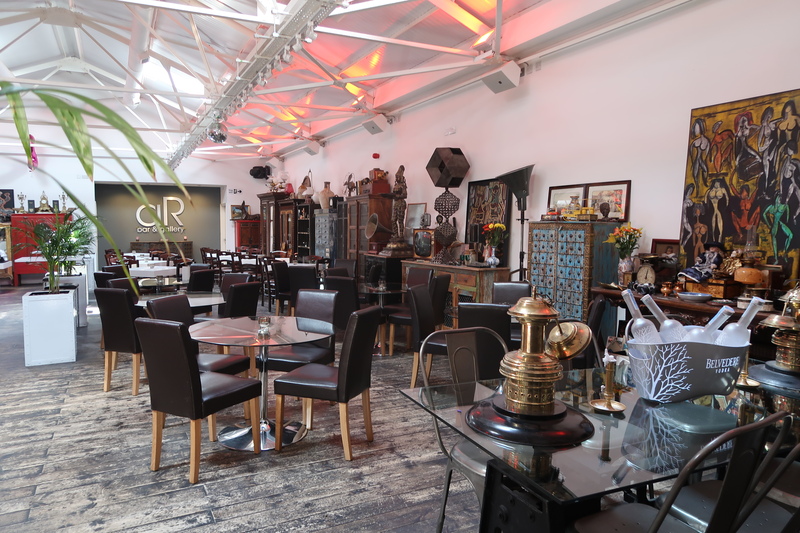 Situated in a former factory in Birmingham’s Jewellery Quarter, Ana Rocha is an enchanting fusion of art gallery, vintage cellar and bar. The menu serves up Spanish-style tapas and wine, alongside classic cocktails. Behind the bar are over 60 different types of gin. On the walls are large abstract canvases by Spanish artist Vera Montalban, alongside mirrors and antique furniture. Everything is for sale! The Edgbaston undoubtedly offers some of the best cocktails in Birmingham. Each of the venue’s three bars has its own personality. The main cocktail lounge is art deco themed in black and gold, the library room stocks spirits in place of books, and the speakeasy downstairs has gold glittering walls. Every cocktail, made by award-winning bartenders, is very much an inventive art form, with many celebrating local culture. Their new gin and campari-based creation ‘Who Wants to go to Mordor Anyway’ is inspired by J.R.R. Tolkien, who lived around here. I stumbled upon Seven Sins after a meeting in Digbeth’s Custard Factory. I felt immediately at home due to the art-covered walls (all by local Birmingham artists), and bright, open space. By day Seven Sins serves coffee, teas, and speciality hot chocolates including red velvet and an indulgent peanut butter hot chocolate. They also offer a collection of cocktails, specialising in cold brew coffee cocktails. Their signature drink, Sinners Brew, mixes coffee with Baileys, Frangelico and cream. It also plays host to live music events and vintage swap shops on weekends. One of the Jewellery Quarter’s best bars, The Lord Clifden is known for their collection of Urban Street Art, with the likes of Banksy, D*Face, Nick Walker, Blek, Obey, Faile and Army Lion. They serve up imported bottled beers, traditional favourites on tap and a decent wine list (much better by bottle than glass). Having turned the Lord Clifden into one of the city’s best-loved pubs, landlord Graham Smith reopened the Red Lion, bringing his genuine love of modern street art with him. You can find Banksy’s Charlie Chaplin in a charming beer garden. I recommend their award-winning roast dinners on Sundays and if you want to watch sport, it has 7 large screens dedicated to Sky Sports. This theatre pub dates back to the end of the 19th century. It has loads of character and – legend has it – its own ghost. The menu offers a very good selection of wines, cask ales and cocktails (classics and seasonal creations). You can also book onto a cocktail masterclass for £25. This is a charming craft beer bar in Birmingham’s Jewellery Quarter. The Grade II-listed premises have been renovated to look like its origins as a jewellery workshop in the 1870s. There is art, craft and jewellery by local artists showcased throughout the building and the bar serves a great selection of craft beers and wine. With on-trend rotating kitchen residencies, you really have to keep returning, and their programme of live music includes Rhythm and Blues, jazz, funk and soul. Under the arches on Livery Street in the Jewellery Quarter you can find a tucked away live jazz bar. It’s the only Birmingham bar to serve Moonshine (if you dare), as well as classic and prosecco cocktails. The creative environment also allows space for art exhibitions by local and international artists. Their varied events calendar includes: Soul Sundays, Salsa classes and open mic nights. Do you have any other suggestions for the best and most quirky cocktails bars in Birmingham? I’d love to hear them, so let me know! Prefer coffee? I’ve also covered Birmingham’s best bohemian coffee shops here.